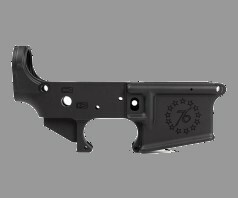 We have a shipment of Special Edition Betsy Ross Lower Receivers on their way! Each Special Edition: Betsy Ross Lower Receiver features a design based on one of the most popular American Revolution flags, with it's 13 stars symbolizing our original 13 colonies. Betsy Ross is widely credited with making the first American flag. The addition of the 76 evokes the Spirit of '76, referring to the self-determination and individual liberty set forth by the Declaration of Independence signed on July 4, 1776. This graphic is engraved on the magwell of our popular AR15 Gen 2 Lower Receiver. Markings Include Model "BETSY" and "1776-XXXX" serial number range. Like all of our receivers, this product is machined to mil-spec dimensions and works with standard AR15 components. 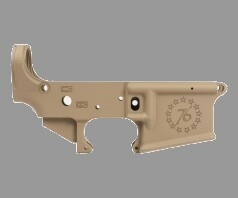 All Special Edition: Betsy Ross Lower Receivers include a commemorative Betsy Ross patch. This patch is limited to those who purchase a Special Edition: Betsy Ross Lower Receiver either individually or in a receiver set. It is not available for individual sale. We’ve got more options for y’all to make that AR of yours even more special! Ejection port cover and pin. How about sumthin just a little different? This package deal includes the finished pieces you need to assemble your own Burnt Bronze Woodland Cerakote M4E1 Rifle, including an M4E1 Enhanced Upper Receiver, AR15 Gen 2 Lower Receiver, Gen 2 Enhanced Handguard of choice and Billet Trigger Guard all finished in Burnt Bronze Woodland Cerakote. Stand out at the range with a unique and eye catching build. This is a one time offer for this finish - once they are gone, they are gone! Selection, Service, Sweet Tea and Down Home Hospitality. Shafter Shootin Irons. Why go anywhere else? What are you waitin for? Come see us right away.